How often have you stood in front of your pantry or the shelves at the supermarket looking for a small snack to get you through to lunchtime? This can be a difficult process as many snacks are packed full of sugar, oils and unpronounceable chemicals. You just want something delicious and healthy to stave off those cravings, right? That’s where energy balls come in. Energy balls are the perfect quick and easy snack. 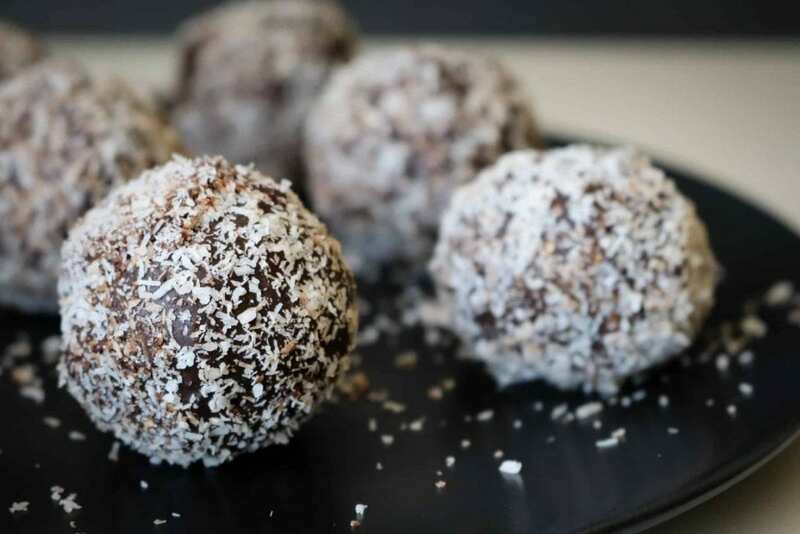 Not only are these energy balls healthy but they have a sweet, chocolatey and rich taste. 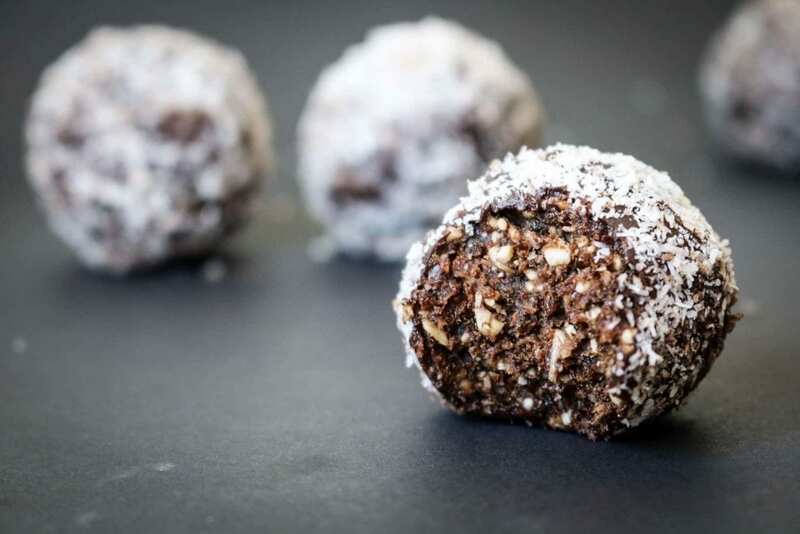 Made with minimal ingredients, you can make these raw energy balls in 10 minutes and can snack on them guilt-free. Are Energy Balls the Perfect Healthy Snack? The base of these balls is a mixture of Medjool dates, oats and cashew nuts. This mixture gives these energy balls some amazing nutritional value. Medjool dates are a great source of energy and are packed with minerals, vitamins and fibre. They are one of the healthiest alternatives for sugar and can be used in so many ways. I love eating dates just like they are, they’re so chewy and sweet. You can read more about Medjool dates here. Follow us on Pinterest for our latest recipes and tips for your plant based journey. 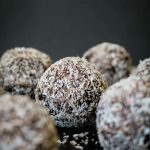 You will need a food processor to make these energy balls as the mixture is rather thick and the Medjool dates are tough to process. I use this Breville one for a lot of my recipes as I find it powerful enough to make short work of anything. You can use a smaller food processor like I had to before I got the Breville, just make sure to split up the energy balls mixture and process it in batches. Add the melted coconut oil and cocoa powder together and whisk until smooth. Add the maple syrup here if you used it. Coat the energy balls in the ganache and place on a plate. Sprinkle some desiccated coconut over the top while the ganache is still wet. Place the balls in the fridge and snack on them whenever the craving arises. You can coat these energy balls in whatever you prefer. Check out some of my favourite coatings like hemp seeds, raw cocoa powder and almond flakes. Also these energy balls are a great method to sneak in some extra superfoods. Ingredients like goji berries, chia seeds and maca powder are a great way to boost your superfood intake and supercharge your day! Did you make this recipe? If you did, rate it and leave us a comment down below! We would love to find out how your energy balls turned out. Tag us on Instagram #deliciousplants so we can take a look! 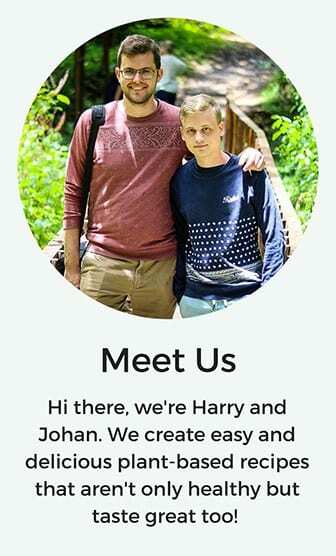 Thank you for spending some time here today! Looking for more chocolate goodness? Try our simple raw chocolate brownies here.